Container xChange, the online marketplace for container logistics – connecting users and suppliers of container equipment in a neutral platform, is launching a new feature that aims to transform the way you book SOC containers with already existing partners on xChange. Once you agreed on the same terms with your partner, you can now send out a new request for the same stretch to this specific partner with only two clicks. „On some stretches, companies work always with the same partner. 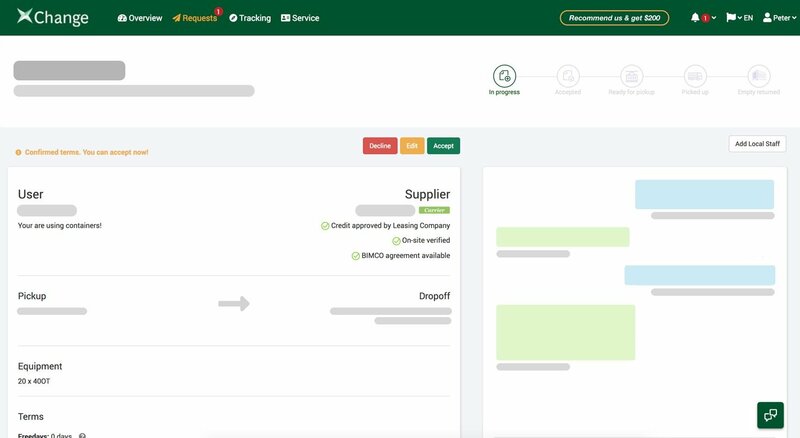 With this feature we allow companies to easily set up a predefined request that can simply be booked without negotiation. The goal is to shorten the time it takes to get a request through“, explains xChange CEO Dr. Johannes Schlingmeier. “In the past our users had to negotiate financial terms such as free-days or per-diem fees for every single request – although they used to work with the same partner many times before. Now you can send a smart booking request to a partner you already worked with straight from your xChange dashboard – the partner can accept right from his email inbox and instantly release the containers.”, says xChange Product Head Lennart Schlüter. The way Smart Booking works is easy: To add a smart booking to your dashboard, you need to send out a “smart booking request” (including your financial terms) to your partner of choice. Your Smart Booking will then appear on your dashboard as soon as your partner accepts the terms. Once you added a smart booking to your dashboard you can click on “Book now”, add the number of containers you need this time and “send” the request, that’s it. xChange implemented not only Smart Booking with their latest release, but they also introduced features to foster communication with your partners outside the platform. “Sometimes it saves our customers time to include local agents, staff members or depots to a request. This way they don’t have to overtype information or forward a bunch of emails. Once you add somebody to a request, they will be able to view the request, use the chat and provide pick-up/drop-off details”, says Product Head Lennart Schlüter. “Addiotionally, we completely redesigned the Request Detail page to increase the user experience”. xChange is the world’s first online platform for container logistics – we connect users and suppliers of container equipment in a neutral platform. xChange now has more than 250 member companies and facilitates more than 300 000 containers globally across more than 2500 locations. Thereby, xChange helps companies such as the world’s biggest carriers, leasing companies, traders and NVOCCs/ forwarders to find or reposition their containers.